Well what a hectic week, it was great being able to help some old friends in their time of need even if it does mean some serious catching up on my chores. We were blessed with a couple of Whale watching tickets for yesterdays cruise and what a pleasure it was in perfect weather. We left really early, wanting to catch the sunrise over the ocean however I should have used the GPS as I missed our exit and lost 20 minutes. We still managed to arrive just before all the colour was lost and so didn't have enough time to setup a tripod for some longer exposures or even use of our ND Graduated filters. We did however manage to capture some awesome colours in RAW for a little post process tweaking. 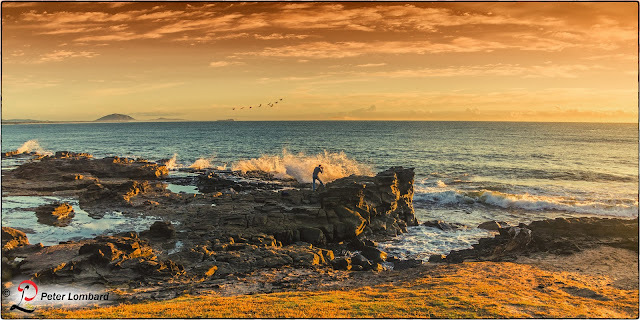 I saw this photographer standing on the rocks while capturing the sea spray as the ocean buffeted the rocks he was standing on. He must have a very weatherproof camera I thought as the waves crashed around him and he was shrouded in salt water spray and mist. I loved his enthusiasm and just had to capture him engrossed in his inspiration. 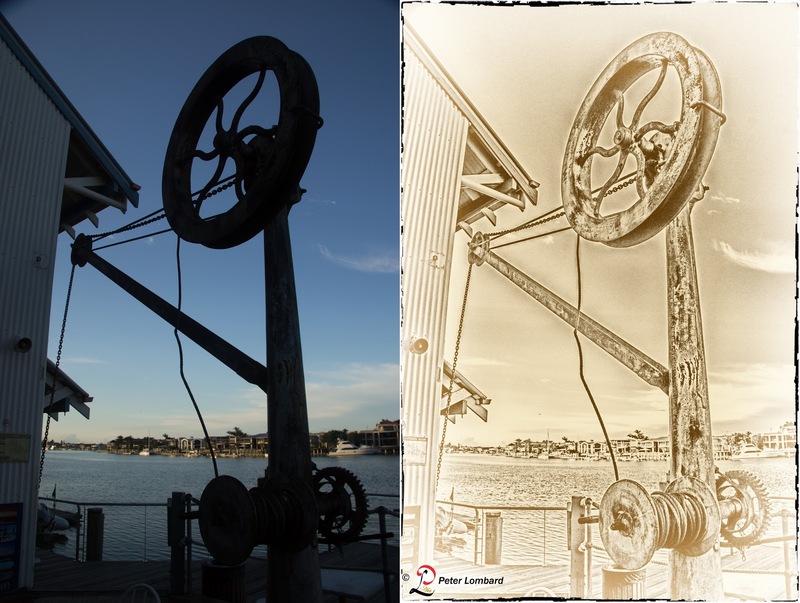 How time flies when you are having fun, in our race to get to our cruise before it departed without us I managed a quick shot at an old hand crane on the wharf which had captured my imagination. I brought it up this morning and was a little disappointed at the result. I hadn't had the time to check my settings before taking the shot and all I seemed to have was a silhouette.... but, I had shot in RAW so I was able to not only salvage the shot but also managed to produce a fantastic old style photo effect as a result. I used Lightroom 4 to extract the detail from the shadows before using Nik's 'Color Efex Pro 4' to add a couple of filters to give the photo that age bleached effect and added a somewhat scraggly border to frame the photo which would hopefully capture the attention and draw the eye inward. As you can see I've included a before and after shot, what do you think of the end result? Please leave your feedback in the comments section.